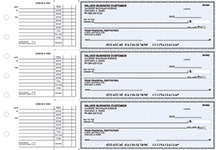 Employ the highest in satisfaction, security and versatility with BuyCheapChecks.com's Laser & Ink Jet Computer Checks. 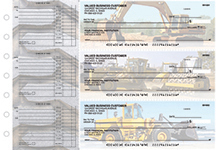 There are several ways to customize your checks by adding a company logo and the addition of two or three signature lines. Our checks are state-of-the-art and offer the latest in security including a security backer on every check and void feature pantograph technology. They also meet or exceed all US Banking Regulations. Shop with confidence when you shop with BuyCheapChecks.com! Choose from Top, Middle, Bottom Style, Blank Voucher or 3-to-a-Page. BuyCheapChecks.com also guarantees all of our Computer Checks are fully compatible with all versions of Quickbooks, Quicken, Microsoft Money, Quick Check, MYOB as well as many others. If you have questions regarding compatibility, please call or fax us your check and we will create a custom template at no charge!